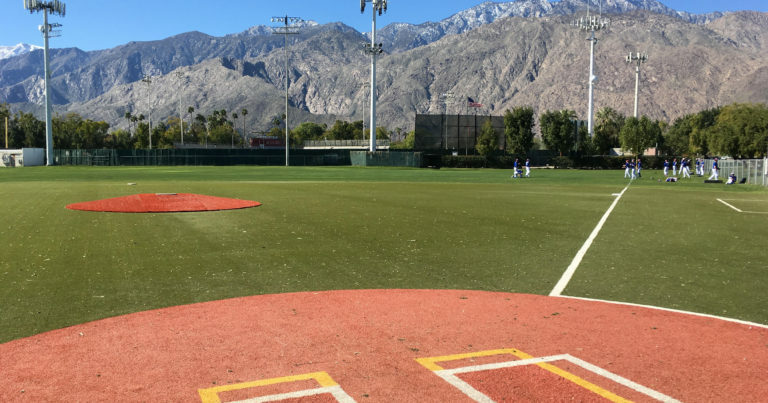 PALM SPRINGS, Calif. – The Palm Springs Chill took down the New York Colonials 6-3 in five innings in the first game of the day on the auxiliary field. The Colonials got things started early by scoring two runs in the first inning on Giovanni Garbella’s throwing error. The Chill answered with four two-out runs in the top of the second. D.J. Daniels launched a two-run home run to tie the game, then Greg Saenz hit a two-run single with the bases loaded to push the lead to 4-2. The Colonials retaliated in the top of the third when Marc-Richard Culmer went yard with a solo shot to make it 4-3. Andrew Kendrick scored on a throwing error in the top of the third to run the Chill lead to 5-3. They rounded out the scoring later in the inning when Brian Pozos walked with the bases loaded. Saenz finished 1-for-3 with a pair of RBI’s for the Chill. Keaton Slack earned the win while Brandon Staples suffered the loss. The Alberta Grizzly and British Columbia Bombers played to a 5-5 tie in game one at the stadium. Bill Pearson led off the top of the second with a single, moved to second on a fielder’s choice, and scored on a Cory Lubinski error at short. Brook Clark hit a two-out, two-run single in the third to extend the Grizzly lead to 3-0. Jensen Kirch walked back-to-back Bombers to start the bottom of the third ahead of Lubinski, who hit a two-run single to cut the deficit to one. Riley Conlan led off the fourth with a single, then went first-to-third on an error in center field and scored on a groundout to tie the game. Christopher Testa scored the go-ahead run on a wild pitch in the top of the fifth. In the bottom of the sixth, Conlan reached on a two-out infield single and scored on an error to re-tie the game at four. Testa hit a one-out triple in the seventh, then came into score the go-ahead run on a sacrifice fly. In the bottom of the seventh, Parker Sniatynski led off the frame with a double, moved to third on a triple, and scored on a two-out single off the bat of Lubinski. The game was called after the seventh. Lubinski finished 2-for-4 with three RBI’s. Conlan finished 2-for-3 with two runs. Brook Clark finished 1-for-3 with three RBI’s. Testa finished 1-for-1 with a triple, hit-by-pitch, a stolen base, and two runs. The Manitoba North Stars and Washington Blue Sox played to a 4-4 tie in the second game on the auxiliary field. The Blue Sox struck first in the bottom half of the first. Yuki Nagao reached on a dropped third strike, moved to second on a wild pitch, third on a ground-out, then scored on Tatsumori Negishi’s RBI single. Trey Bridis led off the top of the second with a single for the North Stars, and came into score a few batters later on Jordan Hurtt’s RBI single. Nick Campana hit a one-out, pinch hit solo home run to give the North Stars a 2-1 lead in the sixth. Washington answered with three in the bottom half. Negishi tied the game at two with a one-out solo home run. Later in the inning, Kodai Kato hit a two-run single to put Washington up 4-2. Cameron Haymans hit a two-out, two-run single with the bases loaded to re-tie the game in the top of the seventh. The game was called after Washington failed to score in the bottom half. Negishi finished 2-for-4 with a solo home run for Washington. Bridis and Haymans both finished 2-for-4 for the North Stars. The Canada A’s earned their first win of the Winter League by defeating the Palm Springs Power 8-5. The Power held a 2-0 lead into the bottom of the fourth, thanks to RBI singles from Jacob Boston and Nicholas Michaels. The A’s would tie it at two into the bottom of the fourth. With runners on the corners, Mike Blackwood-Kirby stole second, but Clayton Conner’s throw sailed into centerfield, allowing Tyler Pfeffer to score from third. Brodie Bryan tied the game with an RBI single. Boston led off the fifth with a double, moved to third on a wild pitch, and scored on a Won Je Choi sacrifice fly to retake the lead. Pfeffer came up with the bases loaded in the bottom of the fifth and lined a single into right to tie the game at five. Ben Mauseth then drove in a run to give the A’s their first lead of the day. Two batters later, Blackwood-Kirby hit a sacrifice fly to extend the A’s lead to 5-3. Two batters into the top of the sixth, Michaels hit a two-run home run to tie the game at five. Canada pulled away in the sixth. Three straight one-out singles loaded up the bases for the A’s ahead of Pfeffer’s sacrifice fly to break the tie. Mauseth then hit an RBI single to left to extend the lead to 7-5, a throwing error on the same play led to the A’s eighth run. Pfeffer finished 2-for-2 with a walk, two RBI’s and two runs. Hibiki Sunaoshi finished 2-for-2 with two runs. Boston finished 3-for-4 with a double, a run, and an RBI. Michaels finished 3-for-3 with a two-run HR, two runs, and three RBI’s. Kyle Lazcano earned the win while Logan Redmond suffered the loss.